Protoneer updated their CNC shield boards, this is causing many throubles for some people. The newer boards has some changes to be fully compatible with GRBL v0.9+ versions. Since CNC shield v3.1+ boards, the PCB has been updated. One of the main news is the Z EndStop and SpnEn pins, they has been re-routed and swaped on the PCB, this mean they are now correctly labered for using with GRBL v0.9+ like 3dpBurner. 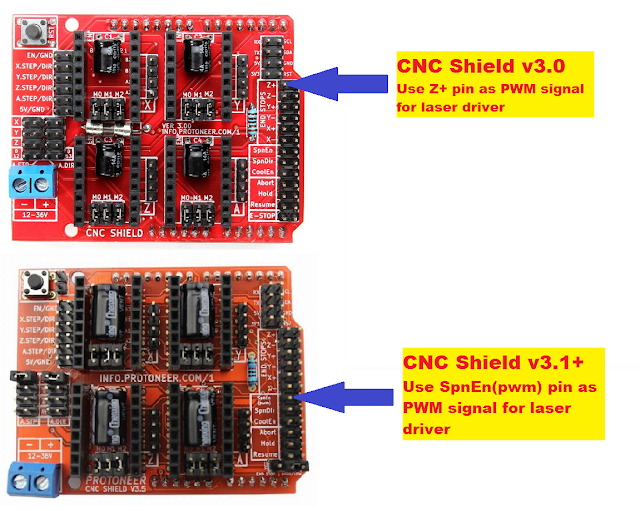 So if your board version is v3.1 or higher connect the PWM wire to SpnEn pin instead to Z+ pin as on previous CNC shield v3.0 boards.